We have now reached the under 40-day mark! I can't believe that we are this close to the wedding! I still have a lot on my plate, and now, another thing has popped up: getting back into shape. For the last few weeks, we have been anticipating a move, and with all of the stress that we have been going through with the bank and the seller, I have admittedly gained some weight. I haven't stepped on a scale (because like the rest of my life, it's packed in a box), but I can tell by the way some of my shirts are fitting, and by the waist on my "skinny" jeans. It's bad, kids. 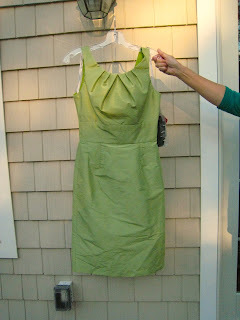 So, since I have left out a few outfits for packing, i.e. : workout-type clothing, I'm going to have to step it up a bit. I have my next fitting in two weeks, so I have only a little bit of time to lose a few pounds. I'm not setting a goal for myself of 10 or 15 pounds, although that would be nice, because I don't think that those are realistic numbers. 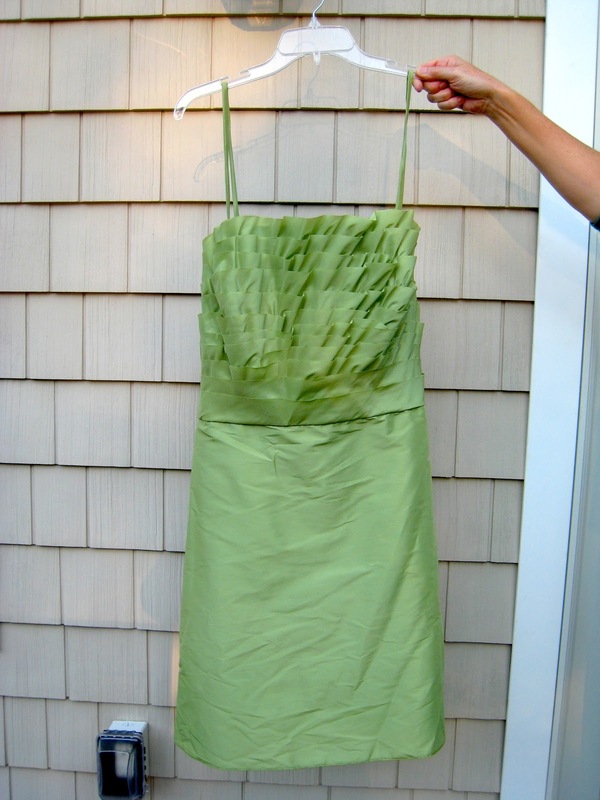 Instead, I'm setting a goal of fitting into my "skinny" jeans again, and fitting into my wedding dress comfortably. So, I think that I'm going to start bringing workout clothes with me to work, and since I typically stay at work an hour later than I need to (for commuting purposes with the FI), I'm going to spend that time working out. Anyone with me on the workout wagon? I need some support, and I bet you do too! 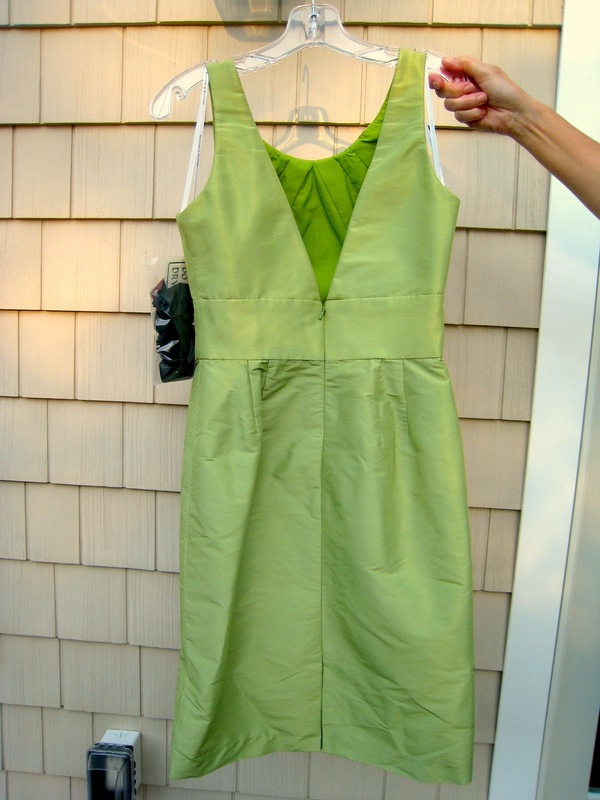 And after stalking the tracking number for the dresses all week, I am so happy to report that the dresses are here! And they look incredible!!! Here are some pictures I took! 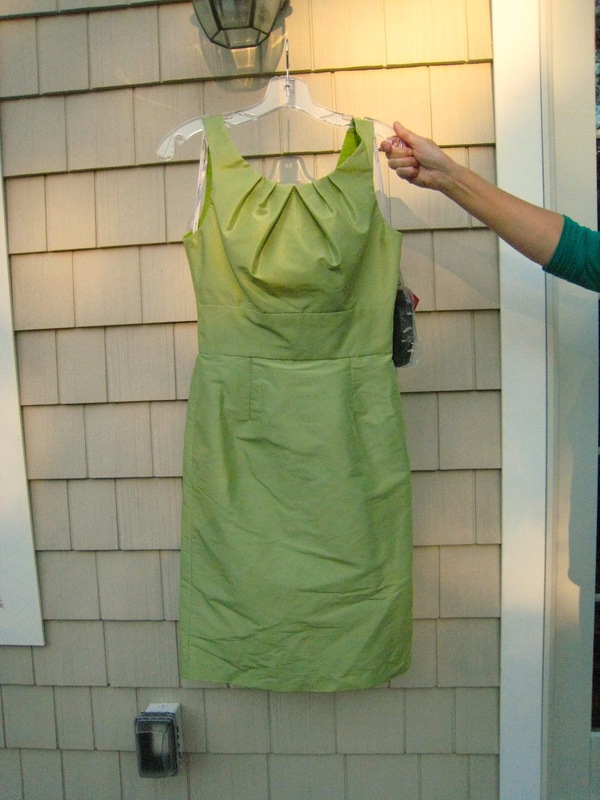 I'll tell you, these dresses look great! The colors match perfectly, even though they look different in these pictures. My little point-and-shoot camera couldn't really capture the colors well. 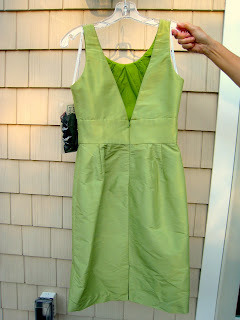 But, now all the girls have to do is get them altered, and then find some silver shoes to go with them! I am so excited to see the girls in their dresses in 43 days!!! Just to remind you, FI and I bought a house in June. But, what you may not know, is that we still haven't closed. Our original close date was July 31. Then, our second close date was August 10. And then, a third, on August 17. It is now past all three of those dates, and we don't actually have a new close date. Needless to say, we are not happy. And now that we are all packed, and I literally mean, all packed, it's just even more so a waiting game. We are currently living out of a bureau and have packed all other clothing items, and all wedding related items, which means that in this hiatus, I can't even work on wedding projects! So, you may not be seeing much around these parts in terms of wedding things for the next few weeks days, so I am apologizing in advance. I will keep posting though, because that may be one of the only things that keeps me sane. Anyone else buy a house and have a closing headache? 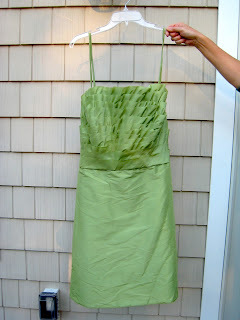 I just got an email from Weddington Way to let me know that my MOH and BM Dresses have shipped! I am so excited to get them in the mail! I will be receiving them, and after inspection, I will send them off to my girls. I can't wait to see pictures of them in them! As I may have previously mentioned, FI and I thought that when we were going to get married, we would ask someone close to us to be the officiant for the ceremony. This was such a great idea, and we thought it would be extra special since the ceremony could be performed by someone close to us. We eventually asked my grandfather to be the officiant, and as honored as he was to have been asked, he ultimately declined. His reasons were fair, however, and I respect him to being able to tell me what an honor it would be, but that he felt it would be too emotional for him to do, and that he wasn't comfortable in expressing that emotion in front of our wedding guests. I know that it would be very emotional, and I am still grateful that we asked him. However, his saying no, meant that we needed to find someone else to do it. We had a few people in mind, but before we asked, I decided to do some further research to find out the actual requirements for performing marriage ceremonies in Rhode Island. And wow, I am so glad that I did, because they are so strange, and nothing like what I expected. For some people who wish to get married in Rhode Island, having a family member or friend officiate will work, but for us, it ended up not panning out. After calling numerous State and City Departments, I was finally able to speak with someone about the Rhode Island requirements for a marriage ceremony. Apparently, there are two different types of marriage ceremonies in Rhode Island - civil and religious. In order to have a religious marriage, the ceremony must be performed by an ordained individual. This means that the ceremony must be religious, and the officiant must fill out an additional part of the marriage certificate that deems the ceremony a religious one. In addition, the ordained individual must be available to submit the signed marriage certificate to the City Hall within 72 hours of the ceremony, which if they are not local, may be an issue since they are not open on weekends. The civil ceremony can be performed by a family member or friend only if you propose a Solemnization of Marriage to the General Assembly, and they must pass a bill that allows for one person to marry you on a specified date only. The Solemnization must be submitted between January and June, which is the only time that the General Assembly is in session. So, with this new information, we were stuck. We couldn't have a family member or friend marry us because the GA is not in session, and we can't have someone ordained to marry us because we didn't want a religious ceremony. So, I started emailing every officiant I could find with a good review, and almost all of them were booked. I finally was able to contact three that were available to perform our ceremony, and interviewed them over the phone. I had a great conversation with all three, however, one just stuck out, and I knew that he would be a great match, even without having met him in person. So, we officially have an officiant for our ceremony - and we're almost 7 weeks out. I guess the timing could be worse, right? Ok, so now that all the cutting and the printing has been completed, I can now show you the final, finished product! And one that I am so super proud of. In fact, I really regret not putting something on the back of them along the lines of "DIY by the Bride" just so I could get a little credit for the hours of hard work I put into making these. Ok, enough blabbering - onto the reveal!! Because my Map & Directions card was double sided and sized larger than the pocket would accommodate, I had to fold it in half. I once again used the boning knife for this, and then gently folded the card at the crease that was made. This worked perfectly, and the ink from the printer didn't smudge at all! The next part was to assemble everything. 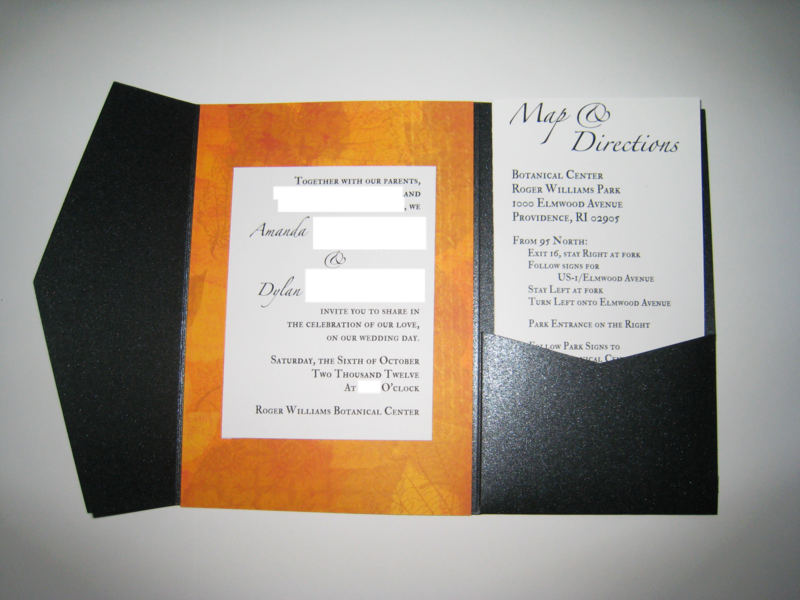 I glued the white invite card to the orange one using a spray adhesive, and then glued both pieces together to the pocketfold. 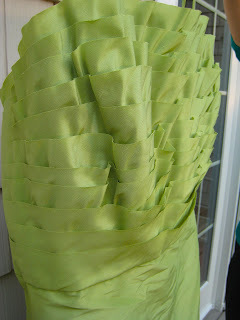 Following that, I started stuffing the pocket part of the pocketfolds. The Map & Directions card went in first since it was the tallest piece. 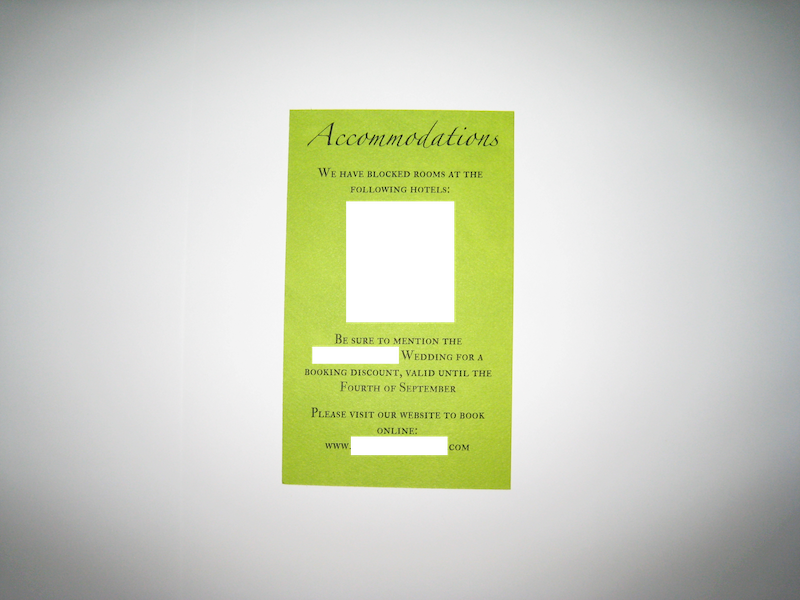 Next was the Accommodations Card. 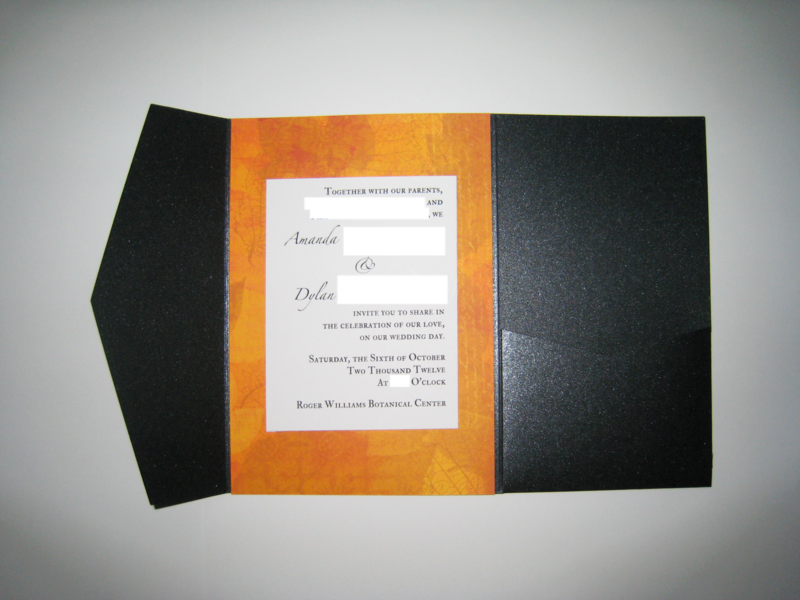 Lastly, was the RSVP Card. I did two different versions, as we had a few people that were not given a +1, so for them, I made a singular form of the RSVP Card. And lastly, the closed Pocketfold. Please ignore the really long fingernail. I decided not to use anything to keep them shut, as it would have added extra weight to the envelope, and I was already at where I wanted to be - $0.65 exactly! I am so so proud of these, and actually wouldn't mind making more! I had a lot of fun with these, and hopefully I'll be able to help a friend or family member make theirs at some point! Anyone else DIY their invites and love it?! 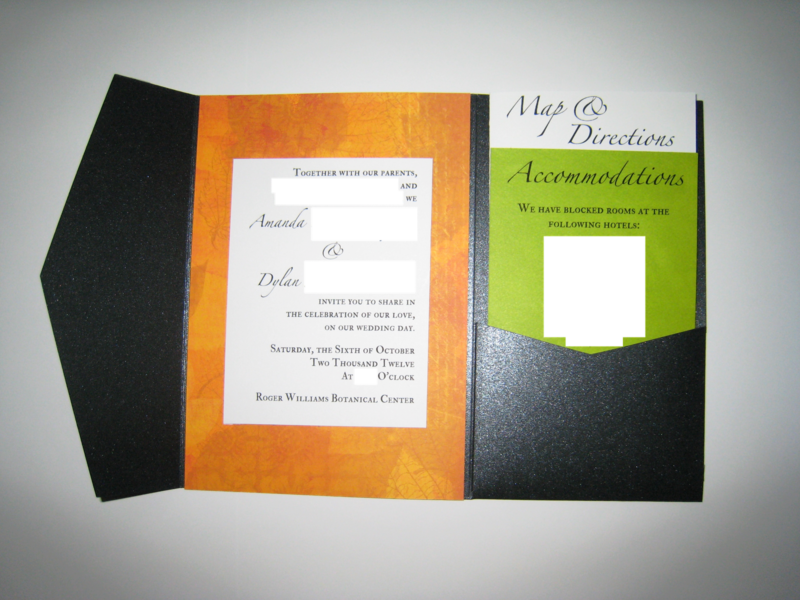 Now that I know our guests, even those far, far away, have received our invites, I can now do our reveal!!! Since I'm terrible at going to the post office, I ended up mailing out the envelopes to my mom to address way later than I had originally planned. To be fair, though, at one point I was waiting for some extras to arrive from Cards & Pockets first, but that shouldn't have delayed me three weeks months. After I finally got all the envelopes, RSVPs included, out to my mom, I started working on the invitations and the other cards for the pocketfolds. 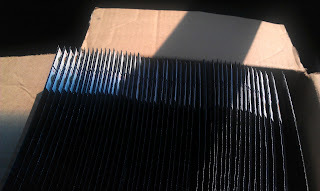 Things actually went a lot smoother than I thought that they would, especially after reading some horror stories from other brides about DIY invitations. First, I spent a lot of time cutting out the paper. Since I ordered scrapbook paper, all of the sheets were 12"x12". And while you think that caused a lot of extra work, the great thing about it was that I was able to make multiples out of every sheet. 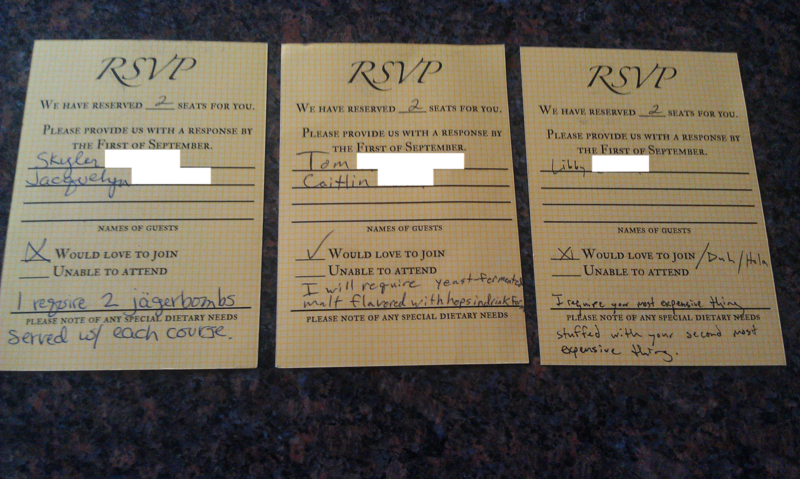 For the RSVPs, I was able to make 8 RSVP cards from every 12"x12" sheet of paper. 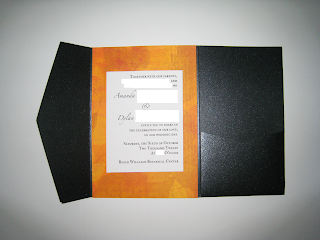 So, the $1.09 per sheet cost, ended up actually only being about $0.14 per RSVP card, not including the cost of ink, which I will not be considering in my invitation assembly, as I already had the cartridges for my printer and did not need to purchase replacements. I'll do a full cost breakdown at the end of this post - back to cutting. To help figure out how much paper I needed, I made some diagrams to figure out the number of cards I could make from each 12"x12" page. For each type of card, I made a grid. For the orange invitation cards, I only did 12x12, with each square representing 1". 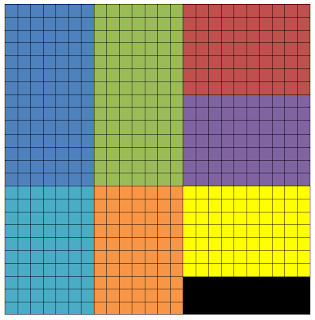 For the other cards, I did 24x24, with each square representing 1/2". As you can see above, I could fit a lot of cards on one piece of paper. 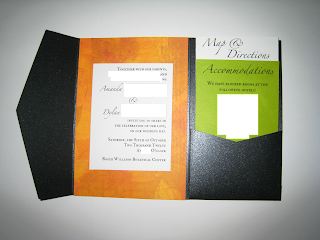 And, for the Map & Directions Paper, since it was just plain white paper, I was able to get some 3.5"x5" cards out of the same page, which is the exact size I needed for the white part of the Invitation. It worked out perfectly! 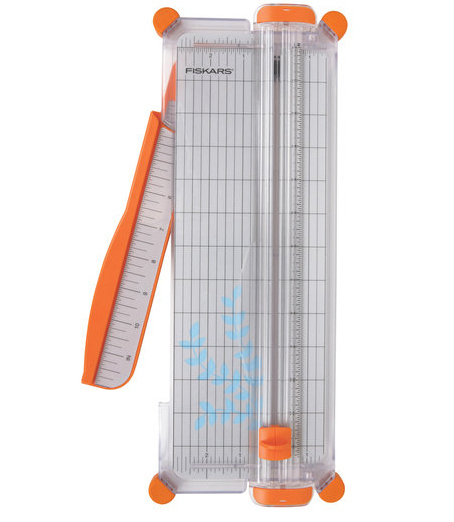 I purchased a paper cutter since I knew that I would be making the invitations for the wedding, and I have to tell you, if you plan to do a lot with paper for something, definitely purchase a cutter. It will be well worth the money. The one that I purchased was by Fiskars, and while I was at it, I also purchased some replacement blades. This was an absolute life saver. Because I cut a lot of paper. I made a total of 56 invitations, all of which consisted of an invitation (two pieces of paper), an RSVP card, an Accommodations card, and a Map & Directions card. So, each pocketfold had five pieces of paper in it. That's a whole lot of cutting. So, first, I marked out the paper where it needed to be cut. Because my paper was double-sided, I made sure I was marking on the opposite side I was going to use. If you have the ability to, use a boning knife to mark your paper instead of a pencil - it will save you time and look better. Then, after marking all my paper, I went through two blades on my paper trimmer cutting them all out. Once they were all cut, extras included, I ran some test prints through my printer. Everything was working fine, so I set them all up to print, but hand-fed each individual sheet of paper to prevent misfeeds and paper jams. That was the most time consuming part, especially since I couldn't really print in front of the television with other people because the sound was so annoying. I'd say that's a pretty darn good number, wouldn't you? 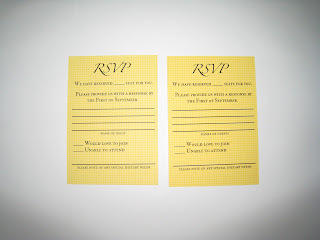 *Number does not include Pocketfold, Invitation Envelope, RSVP Envelope, or Postage. 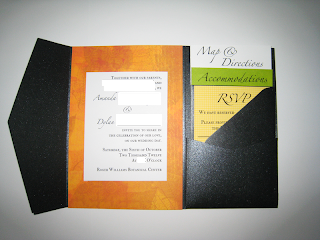 If you include those, the total cost comes out to $3.20/Invitation Suite. Still a pretty good number! Love, Love, Love Our Friends! Our friends are seriously the best. This may not be as hilarious to you as it is to FI and I, but this is SO awesome. 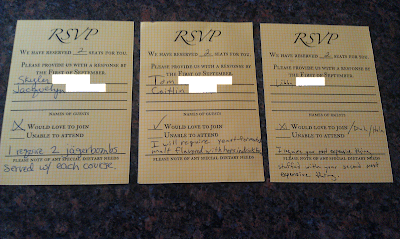 We somehow received all three of these RSVPs in the same day, all from the same circle of friends, AND also from three different states: Massachusetts, Kentucky, and Indiana. RSVP 1 - "I require 2 jagerbombs served w/each course." 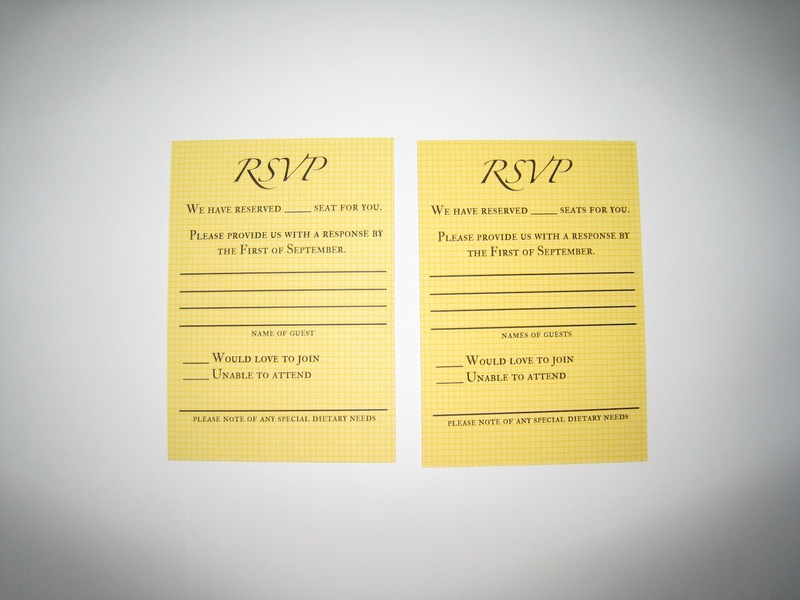 RSVP 2 - "I will require yeast-fermented malt flavored with hops in drink form." RSVP 3 - "I require your most expensive thing stuffed with your second most expensive thing." And I don't even care if that's a word or not. 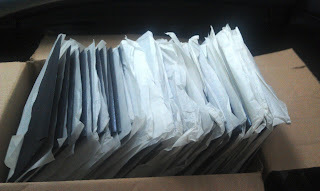 Well, our invites officially went out on Saturday, as you may have seen in the fanciest drop-off ever! And, we officially got our first RSVPs back in the mail today! 3 of them!!! So excited, in case you couldn't tell. And to top it off, all 3 were YES's! Which means that we officially have 6 people coming to our wedding. Only 98 more people to hear from. Don't keep me waiting for those, wedding guests! We finally finished putting together the invites last night, and we just dropped them off at the post office!! I am writing this post from the car, as we are on our way to a friend of ours' formal wedding, so I have dubbed this the fanciest drop off of wedding invites ever. 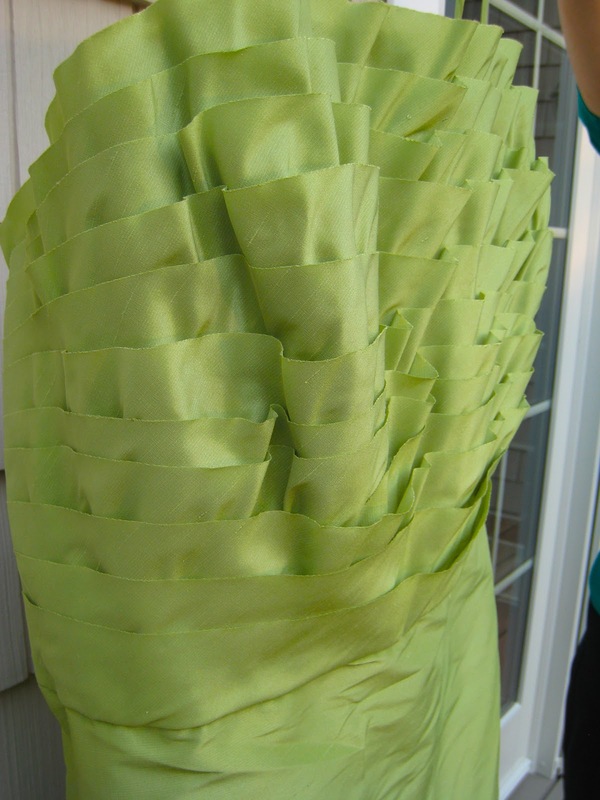 The woman at the post office gave me this really strange look as I dropped off a box of invites in a floor-length formal dress (that I made, btw!) and my hair all done up. But, the fact of the matter is that they are finally out of our hands! A few days later than I had originally planned, but that's my fault for not sending the envelopes to my mom for addressing on a reasonable timeframe. I can't wait to start getting RSVPs! And I really hope that the guests enjoy them, as they were a labor of love. After I know that our guests have received them, I'll do a reveal! Stay tuned!! !